We're delighted that you'd like to join the library! To get a library card, visit any branch of the library. Make sure you bring along a photo ID and a proof of address such as a utility bill or voter registration card in your name. Children can get a library card when they turn five and won't need to show a photo ID and proof of address, but will need to bring a parent or legal guardian with identification along to get a card. 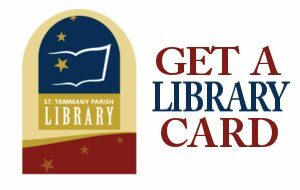 Library cards are free for St. Tammany residents getting their first card. Out-of-parish residents can get a card for a $30 annual fee. Check out books, audiobooks, DVDs, CDs, and magazines. Download eBooks, eAudiobooks, movies, TV shows, music albums and magazines. Do online research from home with our online library. Access your account online to request and renew materials. Suggest that the library buy new items. Can library materials be borrowed without a library card? Can children borrow R rated DVDs without their parents’ consent? Is there a charge for a replacement library card? Can a library card be used at any branch library?